PERHAPS EUROPEANS ARE WAKING UP? Some quick, spur of the moment thoughts about unfolding events in the Balkans and the Lower Danube. I’m referring to Greece, of course, which is in Europe, kind of. Although you’d never know the Greeks were Europeans from the way they’re being treated by their European Union compatriots. This ‘ever closer union’ thing is brilliant, isn’t it? 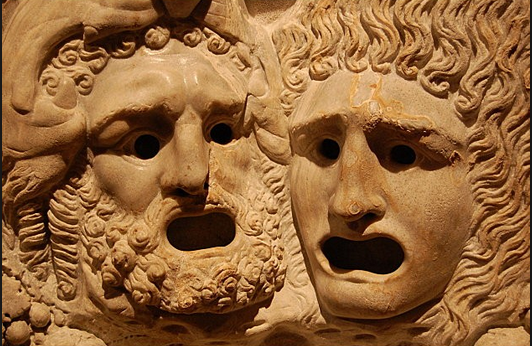 The Greek tragedy is now an epic political ‘game’ about saving the Euro and, by extension, saving the European Union. On the one hand, the bankers and all the banking vested interests are desperate not to lose (more) money in Greece and so are unwilling to chuck good (?) money after bad; on the other hand, the politicos need money to be hosed in to the black hole that is the Greek economy to sustain the unsustainable (the Euro). Everybody’s now buggered if they do and buggered if they don’t, whatever they do! The situation in Greece is truly extraordinary; predictable, but truly extraordinary nonetheless. Notwithstanding, it seems to me that the majority of my fellow citizens here in the UK and the other peoples of Europe have yet to grasp the enormity of what’s going on at the moment. The Euro/EU crisis has barely begun. This is but the thin end of a very thick wedge. Further phases in this drama will involve the Spaniards, the Portuguese and the Italians (to name but 3 nationalities) wanting whatever Greece gets out of this: could be debt relief; could be infinitely more Euros; could be reversion to the national currency; could be economic recovery (outside of the Eurozone). Whatever it is – and nobody really knows at the moment – like I said, the Euro/EU crisis has barely begun. Think internecine turmoil. It’s perversely comforting to know that between them the bankers, the bureaucrats and the politicos are now little more than headless chickens, rushing from meeting to meeting, in the face of the shifting tectonic plates of European democracies and – until recently – neutered sovereign states waking up to reality. The lion of European people power seems to be stirring, and not before time. How appropriate that the cradle of democracy could turn out to be the European Union’s nemesis. PS Meantime, as Athens falls, the BBC floods the airwaves with the tenth anniversary of the 7/7 London bombings. Terrible as it was, does that moment really deserve so much hand-wringing, grief-fest, let’s-interview-everybody-and-anybody-with-the-slightest-connection-to-the-event coverage? I suppose it saves having to look too hard and too long at the looming disintegration of the BBC’s beloved European Union. As much as I love to see a few nails driven into the EU coffin, I reckon there’ll be a last minute deal with Greece, it’ll just prolong the agony though. I suppose the Eurocrats are trying to string things along in the hope of achieving political integration in Europe before the whole thing implodes. There a warning signs worldwide. China is having a problem with its stock markets, Europe is having problems with Greece. There are a few Black Swans lurking around, but one morning some unforeseen event will crash the World economy, the West has been living beyond its means for too long and I think Greece is just a taste of our future: particularly in Europe. I think many of us, if we’re honest with ourselves know that we’re in for a hard time. Some people say: ‘buy guns and ammo,’ but I have cupboards full of these things and they don’t make me feel any better. I’ve managed to get through the greater part of my life without shooting anybody and I don’t want to start now, it’s made me realise how lucky I was to grow up in a Britain where I didn’t have to worry too much about guns. A once Great Britain that has been too easily given away and sold out by self serving politicians. We all need to go into the coming economic catastrophe with our eyes open, hopefully after taking steps to look after ourselves. I’m sorry to be so gloomy, but it’s just the way I and I think many others see things. In the meantime, I must admit, I do enjoy watching the Eurocrats squirm. Without wishing to sound too Maudlin or doom-monger-ish, I also subscribe to the view that we live in a civilisation which is on the cusp of collapsing. The issues for me are not so much that all the evidence suggests that our civilisation is in decline (when measured against the history of previous collapsing civilisations), but the rate at which collapse will proceed, and the scope of the collapse. Some observers (far more knowledgeable than me about our predicament) suggest that full-on collapse could be triggered suddenly and unexpectedly (the proverbial ‘Black Swan’ event); others suggest what John Michael Greer calls the ‘Long Descent’ where our civilisation disintegrates slowly over decades and centuries. You pay your money and you take your choice. If I had to lay money on it, my own view is that collapse will be swift rather than long and drawn out. My principal reason for saying this is that our western, developed civilisation has grown to such historically unprecedented levels of complexity, fragility and inter-dependency that if just a small number of jack-straws are pulled out, the risk of the whole arrangement imploding rapidly is much higher than for previous civilisations. Yes, I think you’re right. The politicians of the World did everything to protect the banks during the GFC in 2008 and only just managed to keep things going: in the long run though, I think they’ll fail. The financial system is like a balloon about to pop. You could liken the financial system to a volcano about to have a very big eruption: before the main event, there’s a lot of tremors and smaller eruptions and then: bang! China and Greece at the moment are like the tremors and smaller eruptions, what the main event will be to trigger the big eruption remains to be seen, but I think it’s not far off. Then of course, there are a few other problems that the World has, that need to be taken into account. MM, I know you’ve endorsed a couple of my posts in the DT, the sentiments of which you echo almost word for word here. http://www.davidstockmanscontracorner.com is a great source of ‘gloves off’ information.As you know, I’ve been following this stuff for years. I tell everone who’ll listen (and some who won’t) to read The Great Deception by Booker and North. I joined UKIP, but I’m somewhat impotent (electorally) here in Spain, as my UK vote lapses this year, having been left Blighty for 15 years.As if all the EU debacle wasn’t bad enough, Uk’s saddled with the ScotNazis and Cameron. I despair! !Regards, Bob Lee. Have just received my copy of The Great Deception and shall enjoy (?) reading it! Hope you’re both well out there?! The Greek’s have certainly put the cat amongst the pigeons. I hope the pigeons lose their heads. The Euro has failed (as anyone with a few functioning braincells always knew it would). With a bit of luck the EU won’t be far behind. The Brits, notoriously bad at learning languages, need to learn one word of Greek ready for Cameron’s Referendum when he finally calls it. So the question remains, how the hell is Europe going to deal with its financial and migrant crisis, because at the moment our leaders look clueless! The lack of intellect at national governmental levels and in Brussels/Strasbourg in particular is my greatest concern, for it is not new. The man on the Clapham omnibus knew right from the start that a federal state made up of different cultures, languages, religions and economies was never going to work – the EU and the euro were doomed from inception yet those running the show missed it completely, or ignored it in their race for personal power. And let’s not forget that every UK government since the euro was created has wanted us to join – only the knowledge that the people would not tolerate it has avoided greater disaster. Even now the fools in the major parties want us to stay in this septic club and I’m sure most still want us to join the euro. Unfortunately we are a placid race, but complacency can only be relied on up to a point. Be aware of that Mr Cameron. We will not tolerate being ruled by plankton forever. This has been tried before by Joseph Stalin et al. Millions murdered, deported and sent to the Gulags, and the big scheme still fell apart. It has been a long wait, but the EU is now falling apart. The great project was doomed from the start. Never in peace time have I seen such an impossible to resolve situation as we have now. Greece has to leave, issue it’s only currency and start again. The alternative is other more productive nations continuing to prop up a black hole economies for ever more. The stooges controlled by the Banks have decided Banks are too big to fail, but now countries are failing. The $64,000 question, which country will be next? BTW Mr. Mint I have been following you for a few years, the Telegraph was a far more interesting place when you were posting regularly. No grovel intended. Thanks Eddie and I concur with your own analysis there which reflects my reply to Peter below. PS Thanks for the compliment. I try to get over to the DT as often as I can; work’s taken a high priority this past 12 – 18 months. I follow the DT articles, but don’t post as frequently as I did. When I can, I do! All the best. Maybe it’s time for a genuine United States of Europe for all these countries, pooling sovereignty, and debt, allowing proper fiscal transfers. For others including the UK, we could go our own way with a simple trading relationship. I think the fundamental challenge there would be in creating a European demos: to make a Belgian think like and associate himself with being Greek; a German to think like and associate himself with being a Spaniard; an Italian to think like and associate himself with being an Estonian; a Slovakian to think like and associate himself with being an Irishman, and so on and so forth.